RVHS Homecoming Queen candidates this year are Madisyn Burd, Adi Fox, Morgan Johnson, Julia Nutter and Josie Jones. BIDWELL — September 24 kicked off Homecoming Week at River Valley High School. Students have had the opportunity to celebrate Homecoming with the Raider Parade, Powder Puff and Powder Buff, the Home Football Game against Wellston, and a theme each day this week. Wednesday there was the Raider Homecoming parade at 6 p.m. starting at River Valley High School. Classes, clubs, the Homecoming Court, and local businesses showedtheir support of the Raiders with “Wreck the Rockets” themed floats. Homecoming Queen candidates this year are Madisyn Burd, Adi Fox, Morgan Johnson, Julia Nutter and Josie Jones. Crowning of the 2018 Homecoming Queen will take place during the pre-game activities at the football game Friday night. 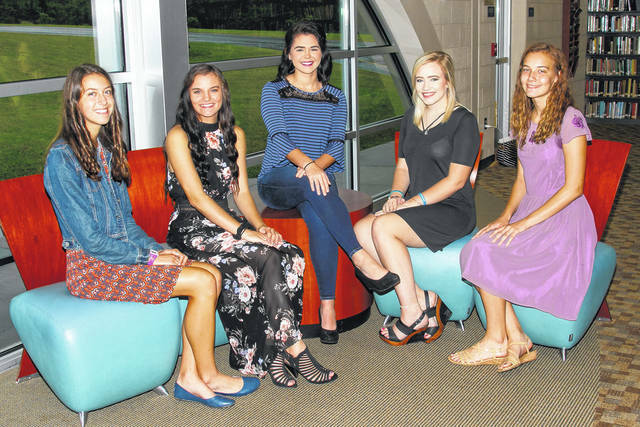 https://www.mydailytribune.com/wp-content/uploads/sites/42/2018/09/web1_TIG_homcomquns109.jpgRVHS Homecoming Queen candidates this year are Madisyn Burd, Adi Fox, Morgan Johnson, Julia Nutter and Josie Jones.